National Bank of Bahrain (NBB) today 15 lucky winners of its flagship “AlWatani Savings Scheme” for the month of August 2018 totaling US$100,000. The details of the lucky winners are available on the Bank’s website www.nbbonline.com. The new enhanced prizes of the 2018 AlWatani Savings scheme provides customers the chance to win an even bigger array of valuable prizes. 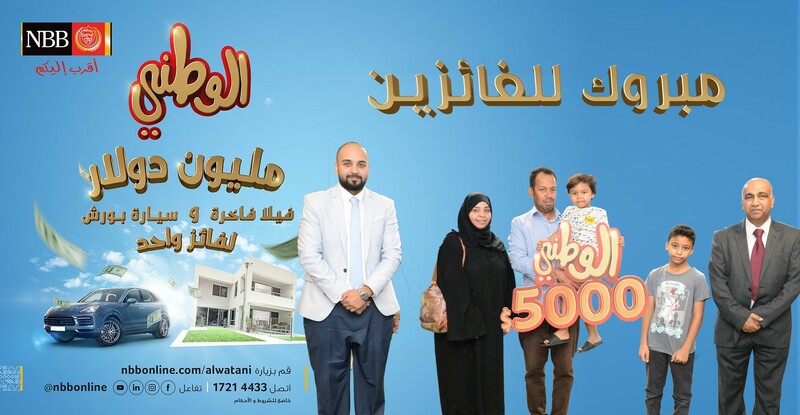 This includes a generous amount of monthly cash prizes in addition to the largest Dream Prize ever to be offered in the Kingdom of Bahrain comprising US$1 million in cash, a luxury villa in Riffa Views and Porsche SUV all for one winner. Qualifying AlWatani customers are automotically entered in the draws in addition to eligible Savings and Savewave accounts, which maintain the minimum required balances. No special accounts or certificates need to be opened or purchased. Previous articleVisit the Euro Motors Showroom and Test Drive Any of the Jaguar or Land Rover Vehicles Available!